"Chorus of the Hebrew Slaves", Va, pensiero, sullali dorate / "Fly, thought, on golden wings"
* The fragment of "Giuseppe Verdi. 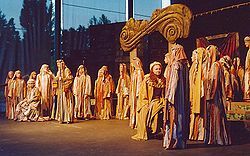 Nabucco. Chorus of the Hebrew Slaves" is presented exclusively for information purposes.